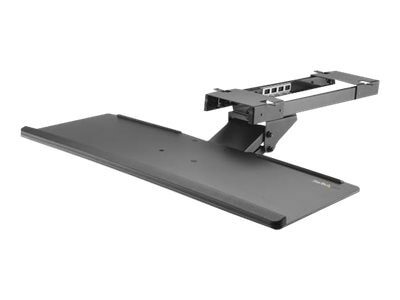 Easily adjust your keyboard tray down or up, with a height adjustment range of up to 6.7” (170 mm). You can slide the keyboard tray in or out from your desk to find your ideal position. Turn the knob at the side to tilt the keyboard tray +15-degrees / -15-degrees for added comfort. You can even adjust your keyboard tray to the left or right, with +20-degrees / -20-degrees swivel.